Robin has been tutoring students for the SAT and ACT, along with a multitude of other standardized tests, for over 25 years. Her lengthy, successful track record has landed many a student at the college of their dreams. Not only does she guide students through the vast array of content knowledge covered by these tests, she also illuminates all of the sneaky strategies that up students’ scores. Additionally, she counsels families on how to lay out a testing plan, how to make smart decisions regarding the college application process, and how to manage the increasingly stressful endeavor. Robin instills confidence in her students during a particularly harrowing time of their lives, and, somehow, they seem to even enjoy the process. Robin possesses the unique ability to tutor students in math, English, reading, science, and the essay portions of all tests. In today’s college admissions environment, many students and parents become increasingly frustrated with overly complicated standardized testing requirements. 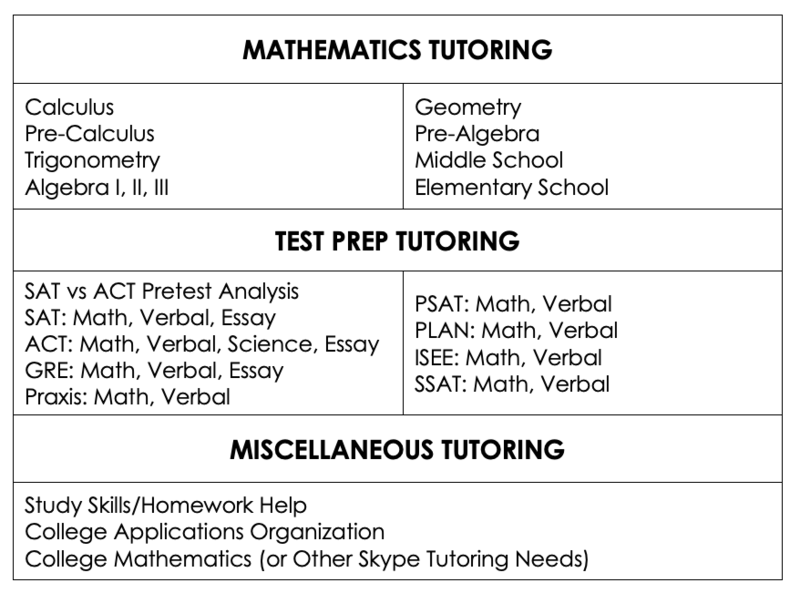 Students may or may not have to take the PSAT, PLAN, SAT, ACT, Subject Tests, and AP tests. To make matters worse, there is little uniformity among colleges and universities, which makes it difficult to know which tests to take and when to take them. The two main tests – the SAT and the ACT – are now interchangeable and with no bias against either test (since 2006). This fortunately or unfortunately leaves families with an important decision to make: which test should I take and when? The SAT and ACT differ stylistically in many ways. The SAT is considered to be a logic and reasoning test and demands a high level of critical thinking. The ACT is considered to be a proficiency test, with questions more closely resembling work that students have previously experienced throughout high school. A good analogy: the SAT is to a crossword puzzle as the ACT is to a high school final exam. Worth noting is the main sources of frustration for students on each test: many students complain about the level of difficulty of the SAT questions, while many students complain about feeling rushed on the ACT. · The ACT contains a science section that can be quite tricky for many students. However, the questions are based on tables and charts that generally do not require any previous science knowledge. · The SAT contains two math tests, one of which disallows the use of a calculator. · The ACT gives four sub-scores all out of 36 (English, math, reading, and science), then averages those four scores for an overall composite score. · The SAT gives two sub-scores each out of 800 (math and verbal), then adds these two scores together for an overall score out of 1600.